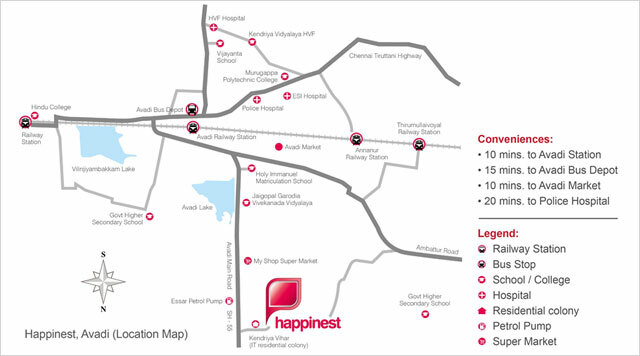 Mahindra Happinest Avadi : You oasis of premium luxury, happiness, comfort and joy awaits you! Chennai is a beautiful city that is known for its pleasing atmosphere, historical landmarks, scientific advancements and a lot more. There is something special about this city that cannot be defined. The real estate market in Chennai has evolved over the years and has a lot to offer today. Mahindra Happinest Avadi is a new residential development by Mahindra Lifespaces that offers a modern-day lifestyle like no other. Extended over acres of land, this development contains beautiful structures that offer 1BHK and 2BHK apartments of different configurations to meet every requirement and taste. With apartment area sizes starting at 345 sq. ft. and going up to 447 sq. ft., beautiful space is what you will find in each apartment. A residential development filled with wholesome goodness is what Mahindra Happinest Avadi Chennai truly is. The apartments are spacious and contain high-end furnishings and fittings, vitrified flooring, anti-skid ceramic flooring in bathrooms and toilets, ceramic flooring in balconies, elegant kitchens with green marble counters and dado tiles, FRP encased composite frames/wooden framedoors and UPVC windows, acrylic distemper on internal walls, hi-tech safety features and a lot more. The external amenities include a number of recreation facilities and a play-area for your kids, dedicated area for senior citizens, community activity centre, grocery stores, auto rickshaw stand, swift elevators, high-end security for total safety and the list goes on. This development also takes-up sewage treatment. Residing at this development will always keep you happy and content. Located at Paruthipattu in Chennai, this development comes in close proximity to a number of your everyday and emergency places like schools, colleges, hospitals, medical centres, restaurants, cafes, cinemas, malls, shopping centres, banks & ATMs, showrooms, convenience stores, supermarkets, all kinds of public transport and a lot more. Starting at Rs 19.30 lakhs, the Mahindra Happinest Avadi price is unbelievable and totally affordable for the luxury, comfort and happiness that it has to offer. Without a doubt, an apartment at this development is definitely worth your savings for a new luxury home. There are different payment plans that you can choose from according to your convenience along with home loan facilities, NRI services and more. Located in the state of Tamil Nadu, Avadi is a well-known Special Grade Municipality and a part of the Chennai Metropolitan Area. This is where you will find a life of pure leisure and comfort each day. With a population of 345,996 people and counting, this beautiful town has come a long way over the years and has a lot to offer its inhabitants today. From industrial areas to commercial and residential areas, you can find it all in Avadi. In fact, the real estate market in Avadi has evolved with a number of residential projects today. 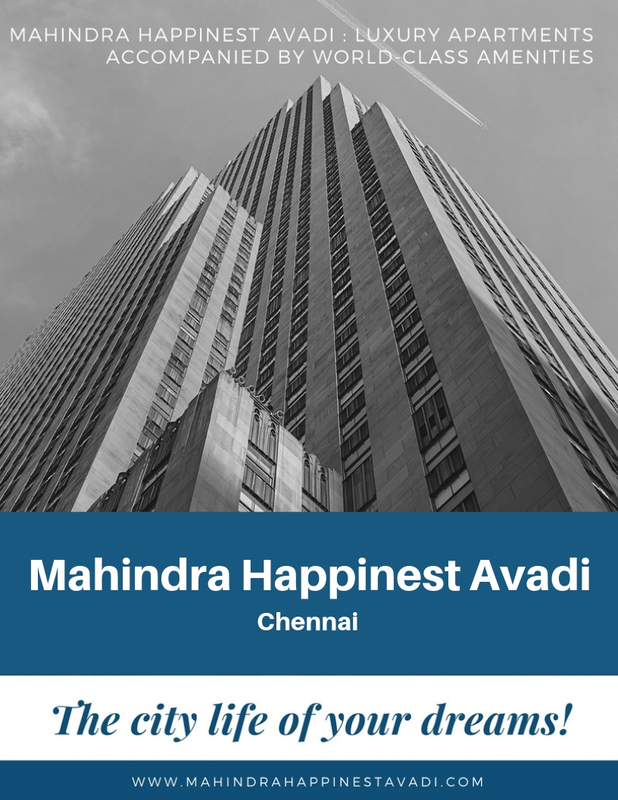 The real estate giants Mahindra Lifespaces and Happinest have come together to create Mahindra Happinest Avadi, a residential project in Avadi, Chennai that is packed with supreme luxury and comfort for a modern-day lifestyle. Spread across acres of land, this development offers 1BHK and 2BHK luxury apartments with area sizes starting from 345 sq. ft. and going up to 447 sq. ft. This development offers a beautiful range of internal as well as external amenities that are truly delightful.